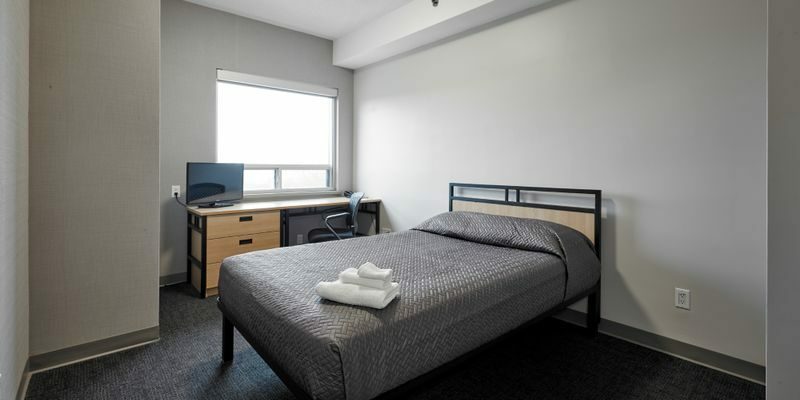 We offer friendly and affordable accommodations from May to August with all suites equipped with two bedrooms, private washroom and kitchenette. Residence & Conference Centre – King City is popular with a wide variety of different types of travelers, including conventions and conferences to our all suite hotel alternative because of our great affordability and value. Enjoy an alternative to traditional hotel accommodations and our Canada’s Wonderland packages along with a convenient location near Vaughan Mills Mall and other King City attractions. We pride ourselves in excellent value, spacious suites and friendly staff. King City offers a relaxed country-feel with easy access to Vaughan Mills Mall, Canada’s Wonderland and an excellent launching pad for day trips into the GTA. Your kitchenette allows you to dine in and save the added expense of going out, the kitchenette is un-equipped, so bring your own utensils. Heading out anyway? Well, bring some snacks with you and keep them in the fridge for later! Enjoy the privacy and comfort of your own bathroom in our all suite hotel alternative. With SMART TV’s in each bedroom, you won’t be fighting over the remote, just bring your own Netflix account! Alternatively catch up on the news, social media in the comfort of your air conditioned suite. Tired of paying phone charges? Call anyone in Canada for free of charge. If you are looking for a hotel near Canada’s Wonderland, look no further and come and stay at our all suite hotel alternative! Contact us for your stay or book your reservation online now!